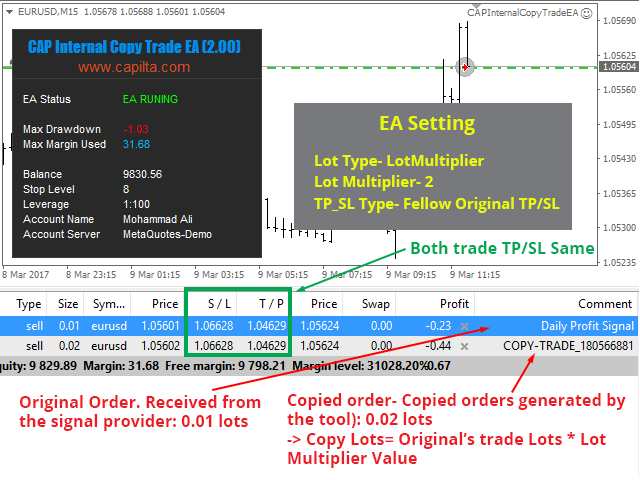 The CAP internal copy trade EA is capable of copying your trade in the same account the same terminal. It is very useful if you have hired the website mql5.com signal to earn investment profits, the lot size on the MT4 software received from the primary signal will be limited to reduce the risk. It is because the lot size is very significant; the investment profits will, in turn, be tiny. The tool is used to increase the size of the order. This tool is set to duplicate the order from the initial order automatically. The already copied order will have the lot multiplier by the parameters declared by you. The process of closing and opening is set to proceed automatically. It happens based on the original order. It is also set to automatically duplicate the amount of take profit and the amount of stop loss. 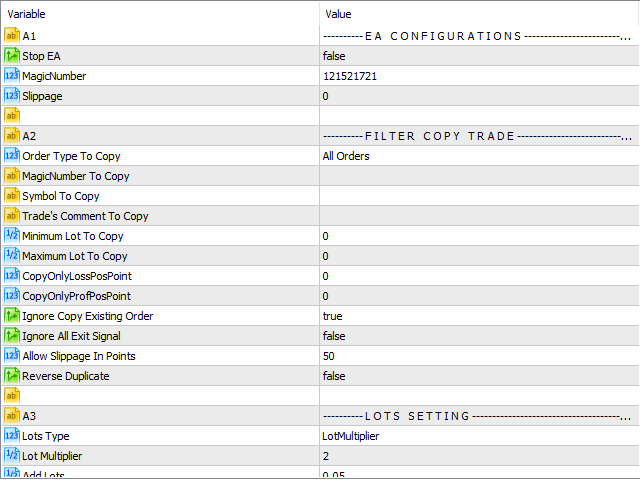 (Duplicated orders generated by the tool): 0.02 lot copied order. You only attach this EA only one terminal into one chart. The tool will work automatically on all currency codes. You can set your copy's trade new TP/SL or you can fellow original trade's TP/SL. You can test this EA on backtest. In backtest EA open random trade and also EA copy that trade. So you can test this EA before buy it. ---> This is not a copier for trade between one terminals to another terminal. ---> Advisor is sufficient to install on 1 currency pair. By default, it will monitor all open symbols. Stop EA: If true, EA will stop copy any trade. MagicNumber: Magic number for EA. Order Type To Copy: Select Order type to copy. MagicNumber To Copy: The magic number of the order to copy, multiple magic numbers can be specified separated by commas. (example: 12222,1234687....). An empty value means that all order will be copy. Symbol To Copy: The symbol of the order to copy, multiple symbol can be specified separated by commas. (example: EURUSD,USDJPY....). An empty value means that all order will be copy. 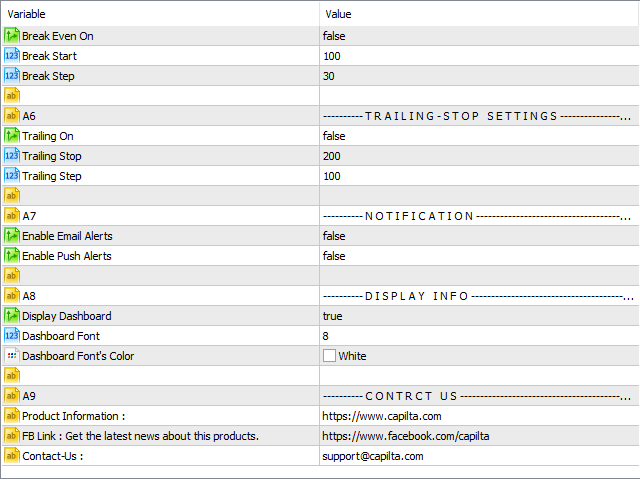 Trade's Comment To Copy: Put trade comment of the order to copy, multiple comment can be specified separated by commas. (example: cap zone recovery ea, Universal...). An empty value means that all order will be copy. Minimum Lot To Copy: Set Minimum lot to copy. Maximum Lot To Copy: Set Maximum lot to copy. CopyOnlyLossPosPoint: Duplicate only those transactions, the loss of which is lower than CopyOnlyLossPosPoint in points. CopyOnlyProfPosPoint: Duplicate only those transactions, which is higher than the profit CopyOnlyProfPosPointv points. Ignore All Exit Signal: If true, EA will not close his copy trades, if original trade closed. Allow Slippage In Points: Maximum price slippage will allow to open trade. Ignore Copy Existing Order: If true, When you attach EA on chart, if already have some existing trade, EA will ignore to copy whose trade. Reverse Duplicate: If true - Reverse trades. (Example: if original trade is buy, copy trade will be sell). Lots Type: Lots type for copy trade. LotMultiplier: Lot multiplier. Lot size = Lot Multiplier x provider's lot size. Add Lots: Lot size = Add Lots + provider's lot size. Lot Multiplier: Value of lots multiplier. Add Lots: Value of add lots. Fix Lots: Value of fix lots. Minimum Lots Size: Minimum lots size. Maximum Lots Size: Maximum lots size. 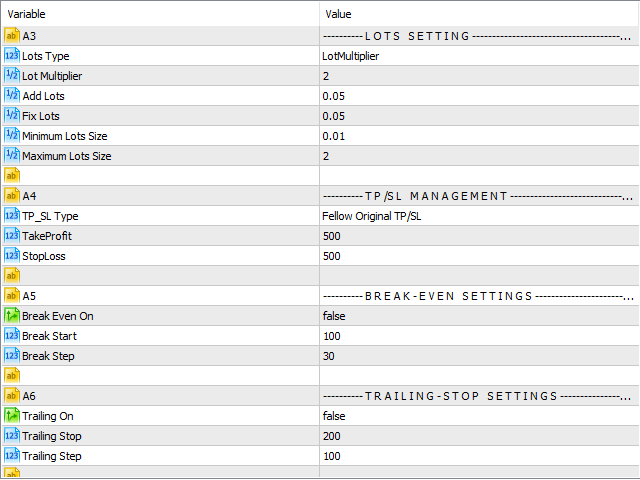 TP_SL Type: Take profit and stop loss type. Fellow Original TP/SL: Copy same original trade's TP/SL value. Set New TP/SL: Set new TP/SL. TakeProfit: New take profit value in points. StopLoss: New stop profit value in points . Enable Email Alerts: If true, send email if any new trade will open/closed. Enable Push Alerts: If true, send push mobile message if any new trade will open/closed. - Bugs Fix - CopyOnlyLossPosPoint and CopyOnlyProfPosPoint doesn't work properly. This version was fix that problem.